Sunny, light-hearted, insouciant, playful, a mixture of Milhaud (flirting with polytonality) and the lighter and more lyrical Honegger, but with moments of saucy sarcasm, Ibert’s Cello Concerto would make a perfect discmate with the respective concertos for the same instrument by his colleagues from Groupe des Six. Writing a concerto with a chamber ensemble accompaniment allows also for a transparency of textures that is rarely heard in concertos with a large orchestra. But Ibert also offers two formidable cadenzas in the second and third movements, very dramatic, evoking Kodaly’s Solo Cello Sonata at times (an observation also made with the cadenza of Honegger’s Concerto, although it was written not by himself but by his premiere performer Maurice Maréchal). Ibert’s relish in writing for small groups of solo winds (in some augmented of solo strings, harp or percussion) is palbable, and it is very nice the way Ibert, in The Gardener of Samos, with a limited complement of instruments (flute, clarinet, trumpet, violin, cello and percussion) varies the textures and combinations in the five movements (the third for instance is a duo for violin and cello, and the fourth, a little fugue for clarinet, violin and cello). The Gardener of Samos, by the way, is the suite in five movements drawn by Ibert from incidental music he wrote for a play by Charles Vildrac. In fact Ibert writes modern Serenades, and that very much defines his art and personality as represented here. The music is charming, entertaining, not profound and not trying to be, but very refreshing, if you are into that mood. But there is also beautiful pathos and aching interiority in the slow movement of the Saxophone concerto. Really those works should be in the usual repertoire of all small ensembles. The program is well-chosen, entirely coherent, and original: other perhaps than the Three Pièces brèves and Saxophone Concerto, this is not customary stuff on CD, and even more so now that the label, Adda, is long gone, and this one has not apparently, unlike many other instalments from Adda, been reissued on Accord. Still, I have two other recordings of the Cello Concerto in my CD collection: one from June 1966 by André Navarra with the Chamber Harmony of Prague under Martin Turnovský, a recording that I already had in the LP era on Supraphon SUA ST 50878 where it was paired with Martinů’s Concertino for Cello, Winds and Piano and Duo No. 2 for Violin and Cello (with Josef Suk), and now reissued (as well as the Martinů Concerto) on a double-CD devoted to the conductor from Supraphon’s “Great Czech Conductors” series, SU 4082-2, barcode 099925408220. The other one is by Dutch cellist Jean Decroos and the Holland Wind Players under Jeroen Weierink on Etcetera KTC 1191, “Made in Paris“, with the same concertino of Martinů and works of Milhaud and Nikolai Tcherepnin, a recording from June 1996 and March 1997, barcode 8711801100098. 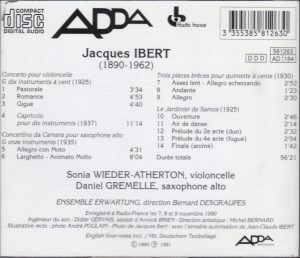 In fact it’s nice to have all three recordings because they illustrate three different approaches, Wieder-Atherton and Ensemble Erwartung on Adda being the most laid-back and mellow, very lyrical but lacking some instrumental presence and bite, Decroos and Holland Winds on the opposite pole, more urgent and high-strung and with more presence and bite but losing something in relaxed lyricism, and Navarra somewhere in the middle. By this you may infer that Navarra, being the better-balanced version, is the one to prefer. 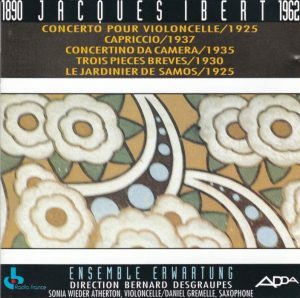 It is certainly a fine version, but I think a touch of additional bite suits Ibert well, and Decroos is also a formidable cellist. The same laid-back approach is again in evidence in Trois pieces brèves (which Ensemble Erwartung play in reverse order, as seems to have become a custom, with Ibert’s saucy first movement used as a Finale). But the approach, which may sound lazy and plodding on first hearing, offers its reward: a genial, relaxed atmosphere which is a convincing possibility in this music, if only as an alternative to more saucy approaches (my favorite among the handful I have in my collection being the Dorian Wind Quintet on Vox CDX 5083, “Music for winds”, barcode 047163508325, with works of Messiaen, Barber, Poulenc, Bozza, Français and Irving Fine). Olympia once published two CDs of “Ibert’s complete chamber music” by sundry Dutch performers, and vol. 1, OCD 468 barcode 5015524404680, also included a fine version of Trois Pièces Brèves, and the Suite from The Gardener of Samos (the two volumes were reissued by Brilliant Classics 6486, barcode 5029365648622). In the latter piece the interpretive approach is sufficiently different from Desgraupes’ on Adda for both versions to be enjoyable. One puzzling thing though is that the percussion instrument used in the second movement is entirely different. With Desgraupes it is unmistakably a tambourine, with its characteristic gingles; with the Dutch ensemble I’m not sure, some drum with a very fuzzy and unfocused sound – perhaps a tambourine without gingles. Without access to the score, I don’t know which is right, but Desgraupes’ instrument certainly sounds better. I won’t comment for the time being on the interpretation of the Saxophone Concerto because, much to my surprise, I happen not to have so far any other in my collection (but that will soon change: “clic! order!”). Note that Newport Classics released a CD in 2013 which includes the Cello and Saxophone concertos, together with Divertissements and Symphonie Concertante for Oboe and String Orchestra, NPD85598 barcode 0032466559822. Attractive program. A note about the barcodes under which you may find this Adda CD on your customary online shop. 3355385812630 is the disc’s barcode, but, through one of Amazon’s customary and highly irksome bloopers (and I seem to see more and more of those), searching on that barcode will lead you to a totally different entry, for a CD from the label Vienna Modern Masters, vol. 5 of their “Music from Six Continents” series, VMM 3005, with works of William Thomas McKinley and Peter Kelly (may be modern masters but I’ve never heard of them). Backcover photo on the entry shows that this 1991 CD from Vienna Modern Masters has no barcode. Exploring the entry further through my Amazon seller account shows that it is indexed on barcode 057888300524 – and it’s not even a case where an entry is indexed on two different barcodes, which sometimes happens. 3355385812630 does not appear visibly on the entry, not in a way that is accessible to a marketplace seller – and still, that’s where a search on that barcode takes you. So, given that a professional marketplace seller with the Adda CD to sell will simply scan its barcode and not even look for discrepancies between the entry and the CD he is selling – what is sold under that entry, Adda or VMM? Well, there was an offer so cheap that I took my chance – and bingo! I received the Adda CD that I wanted. So, you may want to check out first with the seller what exactly he is selling, but that’s your best chance of finding the CD cheap. Now, the same CD is listed, on the Amazons only, under barcode 0723722161629, and there are offers at the time of writing, although expensive. I don’t know what that barcode is, it appears nowhere else than on Amazon, I suppose that it is some distributor’s barcode. Finally, Musidisc picked up the distribution of Adda somewhere in the early or mid-1990s. As mentioned, they reissued some of the Adda CDs under the label Accord, but with some they only stamped a sticker with their own barcode over the Adda CD. Apparently it is what they did with this one, and that’s why you’ll also find an entry (with expensive offers) under barcode 3229262424721. Don’t let my reservations on this or that point of interpretation deter you. There may be better versions of some of those pieces, but this is a disc where, because of the coherence of its program, the total is better than the sum of the parts. There is a slight problem however with Adda’s sonics, in the form of an underlying buzz that you can hear very vividly in the moments of silence at the end of the tracks and even in the softer moments of music. Excellent liner notes by conductor Bernard Desgraupes, TT 56+.